There remain mixed views on where the UK solar industry goes from now, with the more optimistic voices citing imminent grid-parity, the economic benefits of adding storage, and the scope for private-wire arrangements. Aspirations are never absent in the solar industry. But in terms of the real numbers, we have just seen the UK market decline to levels that are fully indicative of a market in transition. On a journey where though? That will be the question still on the agenda for some time to come. 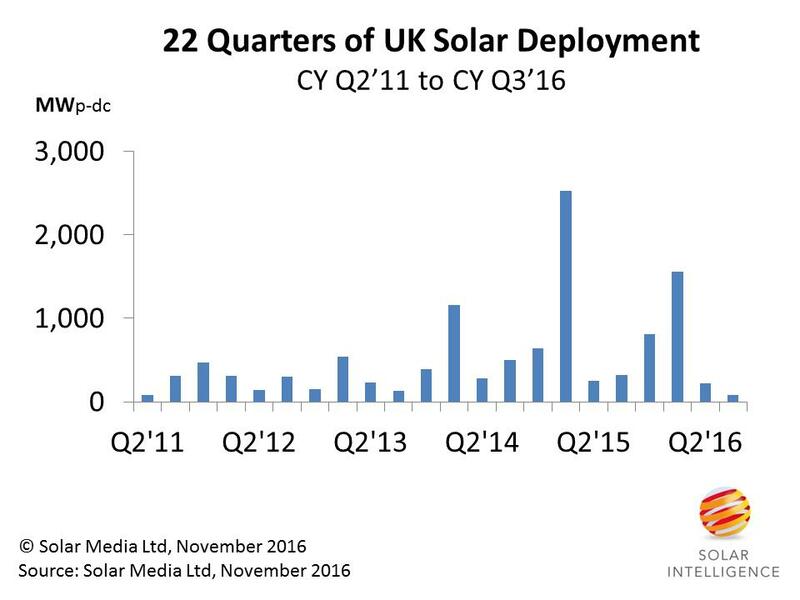 The UK market struggled to reach 100MW of new deployment in the third quarter of 2016 (Q3’16), making this the lowest quarter for new solar capacity in the UK for 22 quarters, or more than five and a half years. Round this to six years for simplicity and we are back to 2010 numbers. The final figure came in at 82MW, with more than half coming from small rooftops, and somewhat back to the old days, before ground-mount farms became commonplace in the UK. Ultimately, the quarter was the first in which the effects of changes to both ROCs and FiTs during 2014 and 2015 were felt by the industry. The problem of runaway solar deployment – on rooftops and fields – is certainly a thing of the past. The current Conservative government has inherited an industry going through the final motions of incentivized growth, and in this respect there are positives that can only be taken, as they no longer have an unwanted problem to solve. The next five months will see the final RO projects built out (all at or below 5MW, under 1.2ROCs/MWh). There is no shortage of options seeking to get built – or more specifically funded by investors, and officially accredited through Ofgem. A handful of companies is actively buying consented sites (as shovel-ready as the climate allows for these days), but many have left the country or the sector, or are deciding what to do with cash-in-bank from the glory days of the past. At least, the good news is that buying modules under MIP is barely an issue now, and module pricing in Q1’17 will be at attractive prices. Memo-to-EPCs: hold off component buys until late January 2017 if you can! The timing of the new-build slowdown is not all bad though. We are very close to the Republic of Ireland announcing its policy for solar, and this is a market that will certainly benefit EPCs and component suppliers that have been learning their trade in the UK over the past five years. One can only hope that the (likely) tendered capacity will not end in a blood-bath of low-ball quotes and over-promises. That said, this is the solar industry. The UK is teetering towards being a 2GW market in 2016, something that was not hard to call after the 1.55GW installed in Q1’16. There are no prizes on offer however for forecasting negative growth going into 2017, with the question simply being ‘how much’. Either way, the terms UK and GW-market are unlikely to feature in the same sentence for many quarters to come. The UK has now passed 11.5GW of cumulative solar installed. A milestone or a millstone? Only time will tell.